Even though days are getting shorter and nights a bit colder, there’s still plenty of great zipline excursions to be had before the snow falls! Autumn zipline tours have you flying over a sea of color under Colorado’s sunshine, or you can join AVA at our Idaho Springs outpost for a Starlight Adventure or Full Moon tour under the night sky. What better way to enjoy the fall foliage and golden aspen trees than flying among them? The Cliffside Zipline tour runs until the end of November each year, and usually the warm weather holds on until close to it’s conclusion. 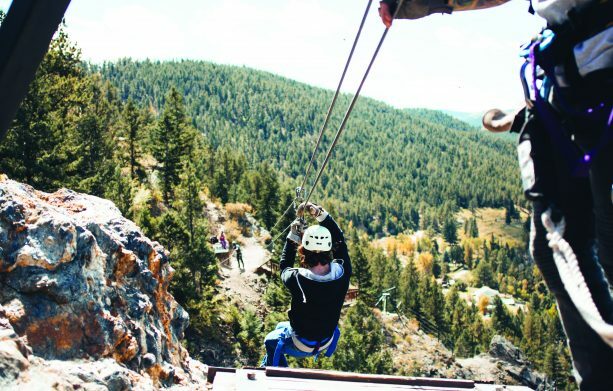 Based only a stone’s throw west of Denver in Idaho Springs is AVA’s Cliffside Zipline and Via Ferrata adventures. Both tours run all the way through Thanksgiving weekend, so if you’re planning on heading to Colorado for your holiday vacation, this makes the perfect family outing to adventure in the mountains for an afternoon. You’ll get to see the Continental Divide’s peaks start to become riddled with snow, while you soar along the cliffside at a lower elevation in Idaho Springs. While whitewater rafting and many other popular summer activities windup at the start of fall, ziplining will keep you entertained until cold weather sets over Colorado’s Rockies. Total zipping distance is 2360 ft. Weight restriction of a minimum of 50 lbs and a maximum of 250 lbs. Idaho Springs also offers starlit ziplining tours after the sun sets over the mountains. Colorado’s starry sky is like no other, and it will leave you breathless if our speedy ziplines don’t already. 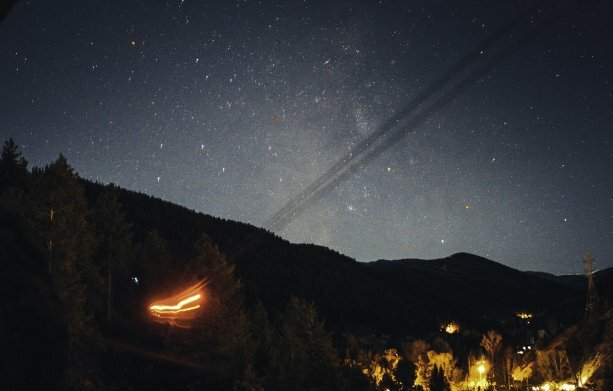 Our Starlight Zipline tour takes off from the outpost on Friday and Saturday evenings at 7:00 PM, and our Full Moon Zipline tour will catch you jaw dropping views of the moon as well as the lit up town of Idaho Springs. We provide you with a headlamp and glow sticks for your tour! Though sunny days in the autumn season can still get pretty toasty in Idaho Springs, the warmth doesn’t stick around long once the sun sinks behind the mountains. Much like spring, fall in Colorado can become unpredictable and you should be prepared for every type of weather. Early season snow is a definite possibility, as is a mid-60’s sunny day in the middle of October. Wear a short sleeve t-shirt and long pants. Bring a sweatshirt in case of a chillier day. Bring a winter jacket, as a cold front can move over the mountains pretty fast. If you don’t need it the day of your adventure, you can always leave it in your car. If you’re venturing our for one of our starlit adventures, the temperature in Colorado drops drastically after sunset. We strongly advise you to bring plenty of layers, including a sweatshirt and a winter jacket. Wear thicker socks and boots to keep your feet warm. We provide gloves for your zipline tour, but you can bring a set of thin base layer gloves if you would like. For AVA’s fall ziplining tours, you’ll meet us at our Idaho Springs outpost 30 minutes prior to your trip time to get your waivers filled out and get ready to go. Once the whole group arrives, we’ll get everyone geared up and talk you through the do’s and dont’s of ziplining. We’ll hop on a truck and take it through historic downtown Idaho Springs on our way up to the top of the cliffside. You’ll zip down our 6-line course back to the outpost, and have an option to buy some pictures once you’re finished. If you’re partaking in either our Starlight Zipline Adventure or Full Moon tour, we’ll equip you with all the regular ziplining equipment as well as a headlamp and some glow sticks to light up your surroundings as you soar your way through the treetops.